In 1987, John was a curious nine-year-old boy. Playing with fire and gasoline, John created a massive explosion in his home and was burned on 100% of his body. He was given one percent chance to live. This epic story of survival was first showcased in his parents’ book, Overwhelming Odds, in 2006. Originally printing 200 copies for friends and family, his parents have sold more than 60,000 copies, most in back-of-the-room sales at John’s speaking events. This book invited John to embrace his mirarculous recovery and share it with the world for the first time. John has grown his inspirational speaking and training business to reach an average of 50,000 people each year at more than 120 live events. John speaks to companies and organizations across industries, such as healthcare, sales, marketing, financial services, education, faith and safety. 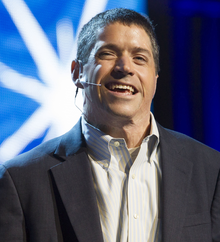 Consistently described as “the best speaker we’ve ever had,” John receives 100% of his engagements from referrals. His schedule is a testament to the power of his message and who he is as an individual. His emotional story-telling, unexpected humor, and authenticity make each of his presentations truly transformational. John has an online community of more than 75,000 and he is a contributing writer to publications such as Parade.com. His first book, On Fire: The 7 Choices to Ignite a Radically Inspired Life, will be published in March 2016 by Simon & Schuster’s imprint, North Star Way. John considers his greatest success to be his marriage to his wife, Beth, their four children and his relationships with family and friends.